PORT STATE CONTROL IS THE INSPECTION OF FOREIGN SHIPS IN NATIONAL PORTS TO VERIFY THAT THE CONDITION OFTHE SHIP AND ITS EQUIPMENT COMPLY WITH THE REQUIREMENTS OF INTERNATIONAL REGULATIONS TO VERIFY THAT THE SHIP IS MANNED AND OPERATED IN COMPLIANCE WITH THESE RULES. WHAT IS PORT STATE CONTROL? CHECK TO SEE SHIPS COMPLY WITH INTERNATIONAL RULES ON SAFETY AND POLLUTION PREVENTION. HAS POWER TO DETAIN SHIPS FOR THIS PURPOSE. THS IS INSPECTIONS WERE ORIGINALLY INTENDED TO BE A BACKUP TO FLAG STATE IMPLEMENTATION. EXPERIENCE HAS SHOWN THAT THEY CAN BE EXTREMELY EFFECTIVE, ESPECIALLY IF ORGANISED ON A REGIONAL BASIS. 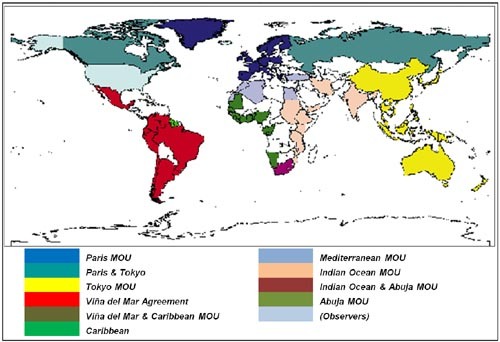 IMO HAS ENCOURAGED THE ESTABLISHMENT OF REGIONAL PORT STATE CONTROL ORGANIZATION AGREEMENTS ON PORT STATE CONTROL- MEMORANDA OF UNDERSTANDING OR MOUs HAVE BEEN SIGNED COVERING MOST OF THE WORLD OCEAN. 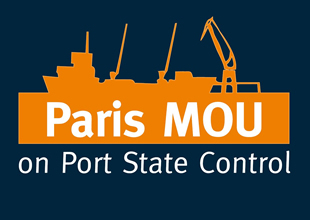 IN 1982 THE PARIS MOU ON PORT STATE CONTROL WAS SIGNED BY 14 EUROPEAN COUNTRIES. PRESENTLY IT INCLUDES 20 MEMBERS(BELGIUM, CANADA, CROATIA, DENMARK, FINLAND, FRANCE, GERMANY, GREECE, ICELAND, IRELAND, ITALY, NETHERLANDS, NORWAY, POLAND, PORTUGAL, RUSSIAN FEDERATION, SPAIN, SWEDEN AND UK). TOKYO MOU ON PORT STATE CONTROL IN ASIA PACIFIC REGION BECAME EFFECTIVE ON 1 APRIL 1994. SIGNATORIES ARE AUSTRALIA, HONG KONG, MALAYSIA, CANADA, INDONESIA, NEW ZEALAND, CHILE, JAPAN,PHILLIPINES, SINGAPORE, CHINA, KOREA, THAILAND.